One good thing about the push to make marijuana legal is that along with regular-old THC weed (that's the weed that gets you high), we're getting more access to cannabidiol, or CBD, which is a component of weed that has all kinds of health effects but does NOT get you high. As a person who loves to be healthy but hates to be high, this is just the best news. CBD is all the rage right now. There are all kinds of reasons and ways to indulge in it, from gummies to teas to lotions. It's effective as a source of stress management, pain relief, and spasm and seizure reduction in people with conditions causing those things. The anti-inflammatory effects of marijuana are well-documented. And inflammation, of course, causes pain and discomfort. CBD has been prescribed (in Canada) for multiple sclerosis pain and for pain caused by intractable cancer. And CBD is legal-ish, with restrictions: According to The Marijuana Break, if you are purchasing CBD that has been extracted from hemp under the Farm Bill of 2014 and contains less than 0.3 percent THC, it is legal to buy, sell and shop to all 50 states. So that means you can buy it without a prescription. You can get different kinds of gummies, but these are gluten-free and contain melatonin in addition to hemp oil (aka CBD). There's 12 milligrams of oil in each of these gummies, and they promise to relieve anxiety, reduce stress, and aid in falling asleep. These are a little fancy schmancy--the acclaimed Icelandic avant-rock band Sigur Ros partnered with a Los Angeles retailer, Lord Jones, to make these all-natural high-CBD candies. They come in flavors inspired by Icelandic berries, like wild blackberries, strawberries, and blueberries. Each contains just five ingredients: natural fruit essences, gelatin, citric acid, sugar and, the finest full-spectrum phytocannabinoid-rich CBD extract. Take these for stress- and pain-relief, plus a calm sense of well-being. So CBD also has big benefits for your skin. Imbue Botanicals face cream deploys organic hemp CBD and ultra-high concentrations of natural, organic vitamin E oil and other essential oils to revitalize your skin and add a youthful glow. Use it every night on your face before bed and expect softer, clearer skin in a week or so. 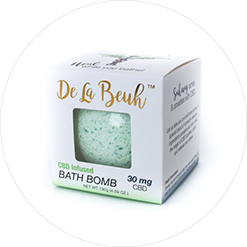 On top of smelling like Girl Scouts cookies, this CBD-infused bath bomb promises to reduce stomach aches, soothe digestive issues, boost energy, and, of course, alleviate anxiety. The Kana Skincare sleep mask is moisturizing and calming thanks to its hemp-seed extract and lavender oil combo. It also contains 28 active botanicals that work to heal, hydrate, and brighten your skin while you sleep. For a more precise dosage of CBD--especially for people living with chronic pain--pills might be your best and most convenient option. You can get these capsules from a place like the CBDistillery or Amazon, naturally. Bear with us. I know what you're thinking: Doesn't coffee do the opposite of relieve stress and anxiety? Not always! Denver-based Strava Craft Coffee uses CBD to take the caffeine edge off. The hemp oil-infused coffee beans help you feel alert, calm and focused, restore balance, alleviate inflammation and pain, and give you a natural sense of peace (or so they say). You can smoke (or, rather, vape) CBD just like regular THC-laden marijuana. You might notice CBD's effects come on a little stronger and quicker with this lemon vape pen. It's made up of 100 percent pure CBD oil, blended with lemon. It promises to reinvigorate you to help you reconnect and regain energy. Oh, yes. We already know the sweet relief chocolate can bring us. Now add CBD oil and you're maximizing the emotional benefits of small indulgences. Lulu's Chocolate makes a bar that's raw, vegan, and organic. It contains 80 milligrams of CBD, is totally THC-less, and promises to relieve stress and put your mood at JOYFUL. Hey, your animals feel stress, anxiety, and pain, too, right? Calm and nourish your pets with this PetBlend CBD oil. There's cod liver oil in here, in addition to the CBD, to ensure your pets are getting fat-soluble vitamins like A and D, which keeps your pets happy and their fur healthy and shiny. Just add a few drops to their food and then do that thing where you pick them up and hug them and they try to squirm away but you just hold on tighter because YOU LOVE YOUR PET. This lip balm aims to hydrate your lips using shea and cacao butter in addition to CBD, which calms, heals, and protects the sensitive skin on your lips.